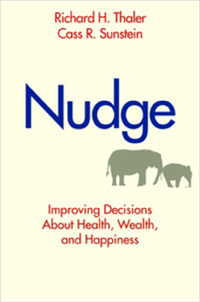 Richard H. Thaler and Cass R. Sunstein, both of the University of Chicago, have written a thought-provoking book full of practical suggestions for improving the decision-making process, titled Nudge: Improving Decisions About Health, Wealth, and Happiness. Based on the title, you might assume that this is a self-help book. It is not. It is treatise on the importance of building into products and services “nudges” that help people make decisions that best serve their needs. Products and services require people to make decisions and—intentionally or not—the way the experience is designed pushes (or “nudges”) people in a particular direction. Where products are placed on store shelves and where foods are placed in a school cafeteria line are examples of “choice architecture” that make it easier for people to choose some things over others. Thaler and Sunstein explain the omnipresence of choice architecture and how it works, then go on to argue that, because it exists, whether planned or not, we ought to design choice architectures that make it as easy as possible to make choices that meet people’s needs. They are not saying that any choices should necessarily be removed or that someone’s idea of a good choice should be forced on anyone, but merely that the providers of products and services ought to consider the needs of their customers and make it as easy as possible to make good choices. One of the prime examples of choice architecture is the existence of defaults in software and other systems. Given the fact that many people will never bother to consider their options, why not make the default choice one that is most likely to work well for them. Many and perhaps most software vendors put little thought into the defaults that they build into their products. A software engineer’s notion of how something should work is insufficient consideration of the matter. Many of the most visible problems that people face today, such as rising foreclosures and poor health coverage, are in part the results of poor choice architecture. Often they’re the results of choice architectures that were designed to benefit some people at the expense of others, such as disreputable mortgage brokers and health insurers trying to maximize their own interests alone. Thaler and Sunstein don’t raise awareness of the problem and stop—they go on to propose many practical solutions to important issues, including environmental protection, prescription drug coverage, financial debt, and even marriage rights. All of us who have opportunities to nudge people in the direction of good choices have a responsibility to do so. To some degree, every one of us is a choice architect—some with influence over many lives and others with influence over a smaller population of family, friends, and co-workers . We can nudge in ways that do not limit freedom of choice. To nudge wisely, we must understand the real needs of people, not just their superficial or momentary preferences, which they often live to regret.